Canadian Daily Deals: Urban Decay at Shoppers Drug Mart BeautyBoutique + Free Gift! Urban Decay at Shoppers Drug Mart BeautyBoutique + Free Gift! Your makeup bag will never be the same again! 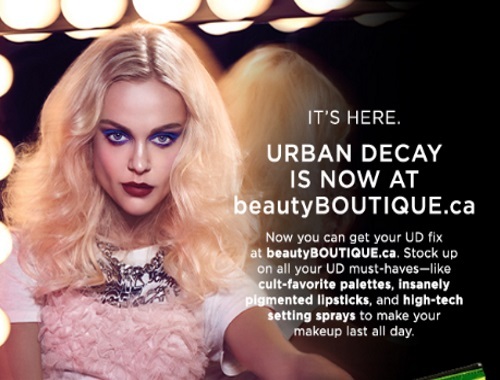 Urban Decay is now at BeautyBoutique.ca! Now you can stock up on your UD fix online at BeautyBoutique, get all the UD must-haves like their cult-favourite palttes, insanely pigmented lipsticks and high-tech setting sprays that make your makeup last all day! The first 100 customers to make a UD purchase of $75 or more wll receive a Free Distortion Stash Bag (loaded with 3 free samples)! I can get Urban Decay at a couple of Toronto Shoppers Drug Marts but for those that can't this is great. Remember you can redeem our Optimum points on BeautyBoutique as well!